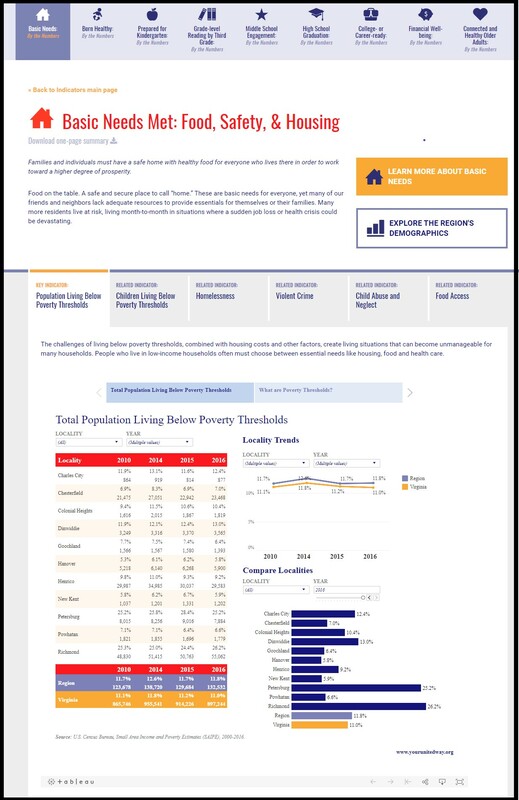 RICHMOND, Va. (Nov. 13, 2018) – United Way of Greater Richmond & Petersburg is launching an online hub to track data related to poverty, homelessness, teen pregnancies and other key measures in the region. The organization previously released an annual Indicators of Community Strength printed report to highlight similar information. The Indicators data will now be updated online throughout the year at www.yourunitedway.org/data. United Way’s new online data hub contains indicators for all nine Steps to Success. The collection of information found on the site reflects the organization’s Steps to Success framework. Built on a foundation of research, Steps to Success identifies nine priority areas on the path to prosperity. These priorities focus on issues and milestones that represent a sequential set of challenges that are best addressed by empowering individuals, families and older adults to reach higher, live better and share in the region’s quality of life. Each Step has an accompanying set of key and related indicators, all of which will be tracked through United Way’s new online data tool. The data provided on the website comes from a variety of highly credible sources, including the U.S. Census Bureau, Homeward, the Virginia Department of State Police, the Virginia Department of Social Services, the Virginia Department of Health, the Virginia Employment Commission and the Virginia Department of Education. Data will be updated as it is available. A one- to two-year lag time in data currency is typical for data from public sources.